Summit area of Kilauea, showing the caldera in which the Halema’uma’u Crater sits. Image: NASA Earth Observatory, July 2010. The state of the lava lake in the Halema’uma’u Crater at Kilauea is now at its highest level since its formation in 2008, reaching 50 meters from the floor of the crater and now covering the inner ledge. 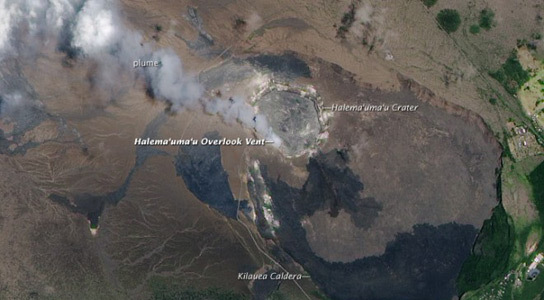 The large Hawaiian shield volcano has a caldera at the summit. Unlike more catastrophic formations, the ones at Kilauea were likely formed by the passive subsidence of the floor of the volcano, starting about 1,500 years ago. This has left a depression of about 3 km by 5km. While it’s common for basaltic shield volcanoes to have more slowly formed calderas, which are caused by the draining of basalt from summit magma chambers, letting ground surfaces slump into the void, the Kilauea caldera is different. The crater was formed by an explosive eruption that started as early as 1790. However, the exact cause of the eruption is unknown. Lava lake at Halema’uma’u Crater on Kilauea seen at its current high stand on Oct. 19, 2012 in the HVO thermal webcam. Captured by Jim Acker from the HVO webcam. There is also a vent within the Halema’uma’u Crater, and this is where the lava lake stems from, implying that there could be as many as four levels to this lava lake. Whatever happens next is all dependent on the rate of magma influx into the summit chambers at Kilauea. The more magma there is, the more pressure created to raise the level of the lava lake. The crater is already releasing about 750 tonnes of sulfur dioxide per day, and this vigorous activity at the crater is also producing some ash. 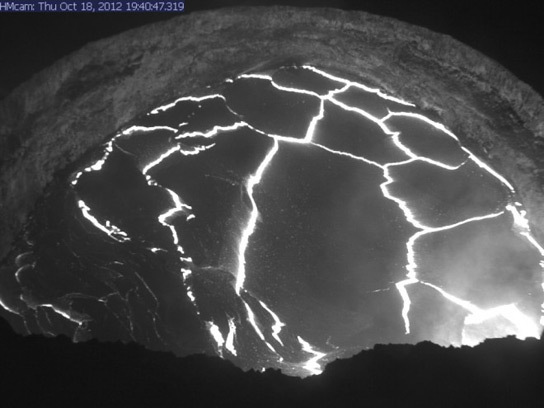 Webcam capture of the surface of the Halema’uma’u lava lake. Image: Mark Burns from HVO webcam. 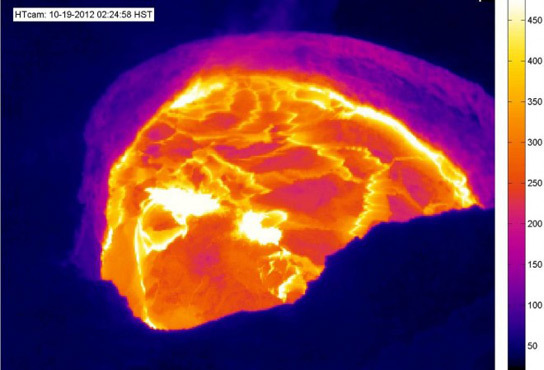 Be the first to comment on "Kilauea’s Halema’uma’u Lava Lake At Highest Level"